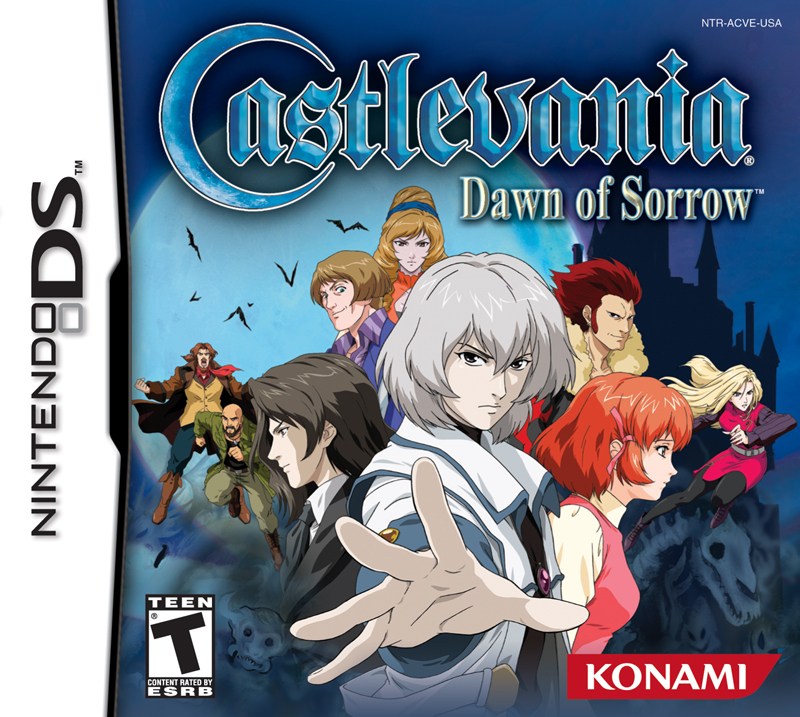 Castlevania: Dawn of Sorrow is the direct sequel to Aria of Sorrow, and is the first installment of Castlevania in the Nintendo DS system. On top of the interesting soul system and colourful NPCs, it added weapon upgrades, dual screen, and a somewhat annoying seal-system. You play as Soma Cruz, a few years after the adventures of Aria of Sorrow. A cult, lead by a shadow priestess named Celia, seeked to revive the dark lord. She was accompanied by two candidates aiming to be the dark lord, and the way they can become the dark lord is by destroying Soma - the reincarnation of Dracula. 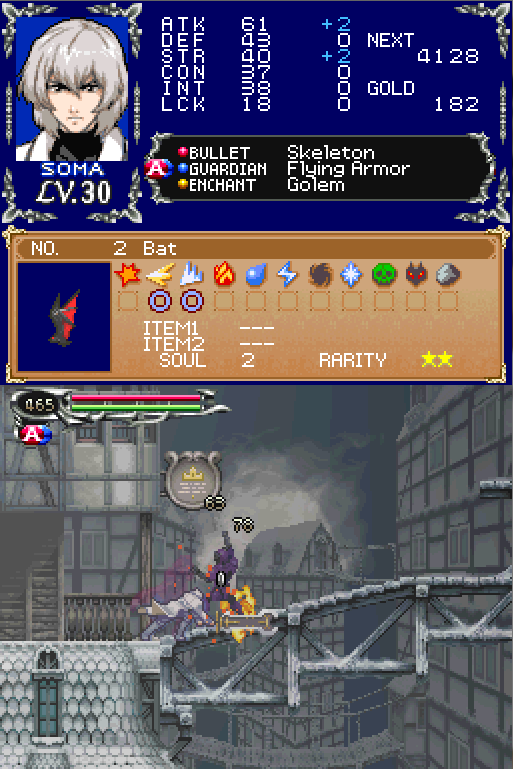 Dawn of Sorrow is very much a sequel to Aria of Sorrow - more than any pair of games int the Castlevania series. Not only do you play the same protagonist, you also have the same cast of friendly NPCs and gameplay loop. Soma, of course, starts over without much equipment or abilities, but you still wander around the castle, defeat monsters and bosses, meet NPCs, collect equipments and acquire Tactical Souls from enemies. One obvious difference between this game and its predecessor is the graphic. The Nintendo DS has two screens, and it is very helpful because the top screen can be set to display either the minimap or the status (of both your character and the enemy you are fighting with or just fought). It also has higher resolutions which display very beauiful graphics (both foreground and background). Some people might be put off by the switch to an anime art style - but as far as anime art style go, it is still quite pretty. The touchscreen, though, is mainly used for the “magic seal” system, which basically mean drawing a continuous line between different points on a circle. Whenever you are about to defeat a boss, you are required to draw a specific magic seal. And if you are not able to draw it within a time limit, or you made any mistakes, the boss would stay alive, and you need to deal some additional damage to it before you can attempt the magic seal again. This system means you need to switch quickly between pressing buttons and drawing on screen, and is personally quite annoying. Apart from the annoying magic seal system, everything else is very fun. The castle is still very open and enjoyable to explore, with varied zones and themed enemies. Julius Belmont and Arikado/Alucard actually actively work with you to defeat the evil cult; Hammer still sells you things and chat with you; and Yoko Belnades updates you with information as well as upgrades you weapons with the souls you acquired. This gives you something else to work on during exploration, and also gives you some reasons to switch between weapons and weapon types. Castlevania: Dawn of Sorrow is a very enjoyable game. What works in Aria of Sorrow still works here, and if you like (or can at least look past) the anima art style and the magic seal system, you can definitely find a lot of fun here exploring, fighting the bosses, collecting and upgrading everything and having a good time with familiar faces.